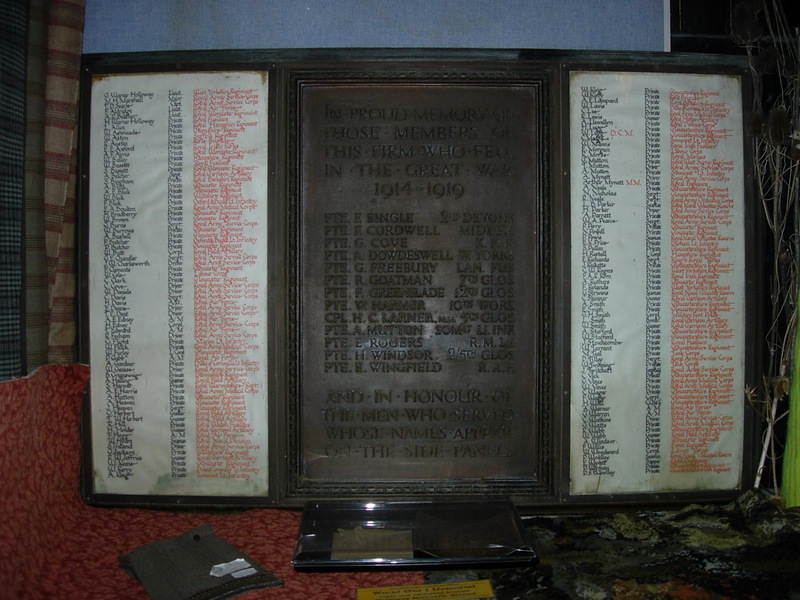 The war memorial from Holloway Bros, clothing manufacturers, listing their employees who were killed in WW1. 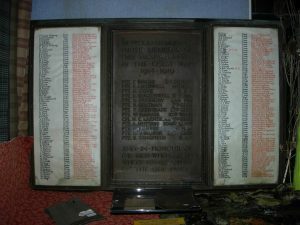 The side panels list those who served and returned. 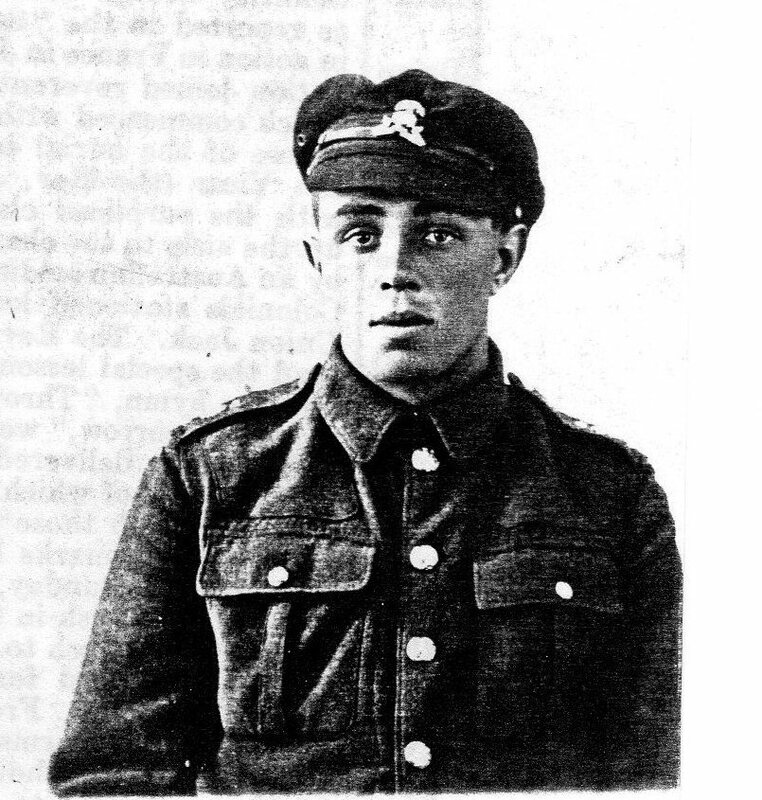 He enlisted in Stroud with the 1st battalion of the Middesex Regiment on August 17th 1915, five days after his 18th birthday, travelling to France with the British Expeditionary Force on 3rd May 1916 and returning home on 1st August having been wounded in the head at Armentieres. He was treated at the King George Hospital in London. After 10 days leave at home, he returned to duty at the end of September, later to return to the front in the bitter cold of 1st January 1917. He was killed in action at Ypres in Belgium on May 15th, aged only 19 years. 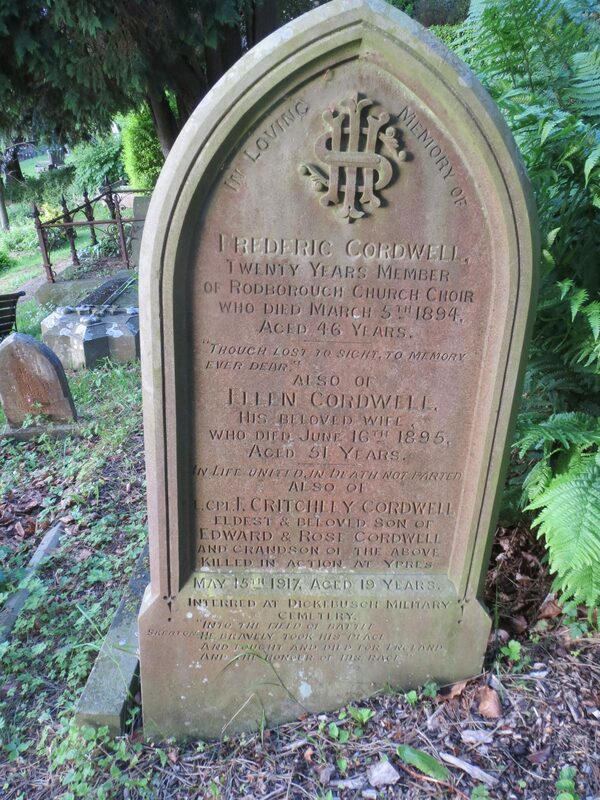 ‘Ted’ Cordwell is commemorated on his grandparents’ grave in Rodborough churchyard. He is also remembered on Rodborough’s war memorial tablet inside the church. Arthur was drafted for service under the ‘Derby Scheme’ in early 1916 aged 35. He was married with children. In 1911 the family lived at Cashes Green and Arthur was a tailor’s presser. Initially Arthur was with the Gloucestershire Yeomanry, but later transferred to 5th Battalion Yorkshire Hussars (Alexandra, Princes of Wales’ Own). He had been in France for about six weeks when he was killed died in an operation as part of a raiding party on 25th May 1918 before the battle of The Aisne. His wife Alice and family were then living at Providence Cottage, Butterrow. Grantley Freebury is commemorated with his uncle Edward Jones on a family cross in Rodborough churchyard, designed and created by the Freebury Memorial Firm. Freebury & Hillman were the stonemasons responsible for the construction of Rodborough’s memorial tablet. Grantley was born in 1898 and lived at 2 Woodlands Terrace, Slad Rd, Stroud. According to Stroud News reports, he was mobilized at the commencement of war as a bugler. He would have been only 16. At 18, he was transferred to an infantry regiment, the 18th Lancashire Fusiliers and was promoted to Lance Corporal. On 17th July 1918 he fell in action in Belgium aged 20. Born in Rodborough in early 1886. In 1891 the family were living at Bowbridge, but following his father’s death in 1893 they are found in Rodborough, at Rock cottages on The Butts in 1901 and on the Bath Rd in 1911. Fred was a clerk in the accounts dept. of Holloways clothing manufacturers. He joined up on May 4th 1916 with the 12th battalion of the Gloucestershire Regiment and was posted to France on 31st August 1916. He was noted in the Stroud News as serving with Private Parrott, both technical clerks in the accountancy office of Messrs, Holloway Bros and much to their gratification they are soldiering together being in the same tent with other Stroud pals too. What could be better? The next time Fred features in the paper it is to report his death. He was wounded in the head on 5th May 1917 in France and taken prisoner. Fred had died at Langensalza prisoner camp in Germany, on May 5th, twelve months to the very day since being taken prisoner of war.